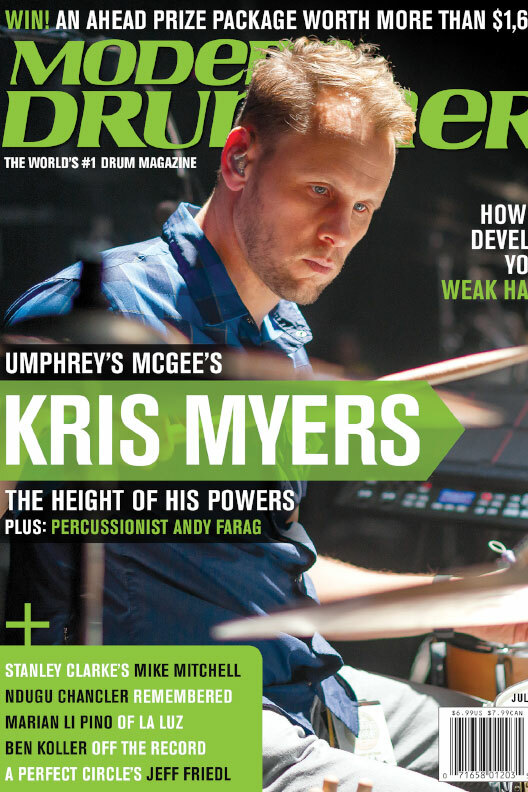 Kris Myers ’98, drummer of the rock band Umphrey’s McGee and a graduate of the Elmhurst College music program, has been a fan of Modern Drummer magazine since he was a kid. Now he’s made it to the cover. Modern Drummer, known as the world’s most widely read magazine for drummers and percussionists, reaches more than 103,000 readers each month. Its first issue, in January of 1977, featured legendary jazz drummer and bandleader Buddy Rich. When Myers learned that he was chosen for the July 2018 cover, he immediately told his mother, and then his girlfriend. Twenty years after forming at University of Notre Dame, Umphrey’s McGee gives about 85 performances a year, touring across the country. Myers, who lives in Nashville, joined the band after the original drummer left in 2002. Myers also works with Goodnight Nurse, a production partnership that writes and licenses music for TV and film.